When an object moves in a gravitational field, it usually experiences a change in kinetic energy and in gravitational potential energy due to the work done on the object by gravity. Similarly, when a charge moves in an electric field, it generally experiences a change in kinetic energy, and in electrical potential energy, due to the work done on it by the electric field. By exploring the idea of electric potential, we can simplify our calculations of work and energy changes within electric fields. 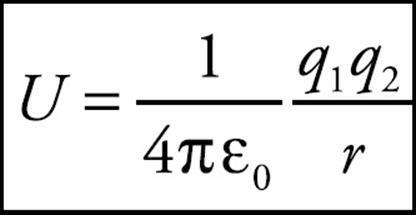 Notice that this is the same equation that defined the change in the gravitational potential energy of an object of mass m undergoing a displacement in a gravitational field (ΔUG = –WG). What is its change in electrical potential energy? Note that the change in potential energy is negative, which means that potential energy has decreased; this always happens when the field does positive work. It’s just like when you drop a rock to the ground: Gravity does positive work, and the rock loses gravitational potential energy. Example 2 Do the previous problem, but consider the case of a negative charge, –q. Solution. In this case, an outside agent must be pushing the charge to make it move, because the electric force naturally pushes negative charges against field lines. Therefore, we expect that the work done by the electric field is negative. 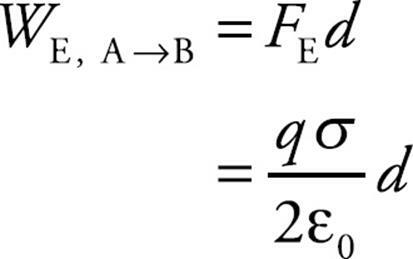 The electric force, FE = (–q)E, points in the direction opposite to the displacement, so the work it does is WE = –FEr = –qEr, and the change in electrical potential energy is positive: ΔUE = –WE = –(–qEr) = qEr. Since the change in potential energy is positive, the potential energy increased; this always happens when the field does negative work. It’s like when you lift a rock off the ground: Gravity does negative work, and the rock gains gravitational potential energy. 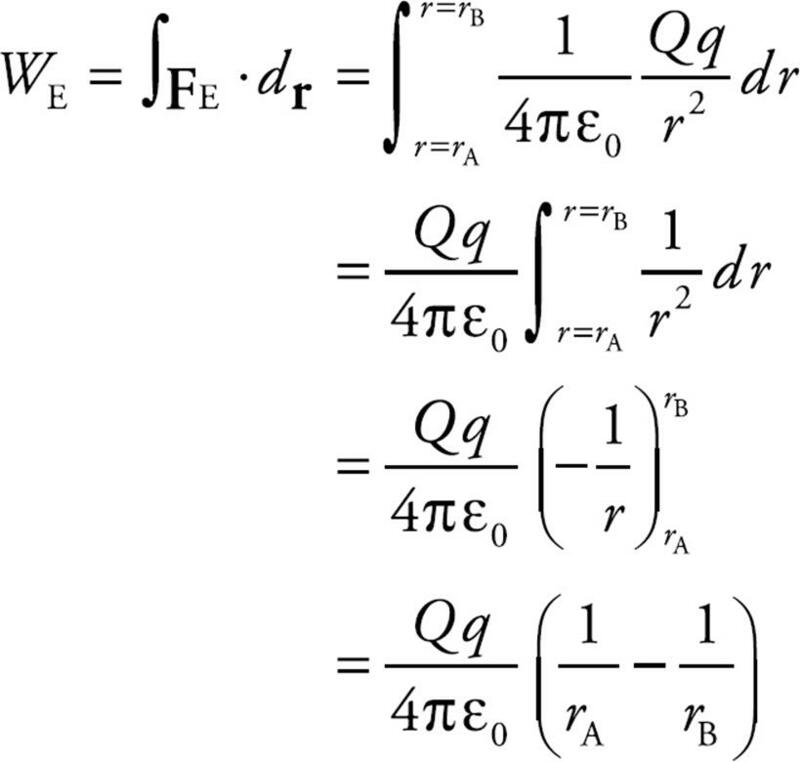 Along r1, the electric force does no work since this displacement is perpendicular to the force. 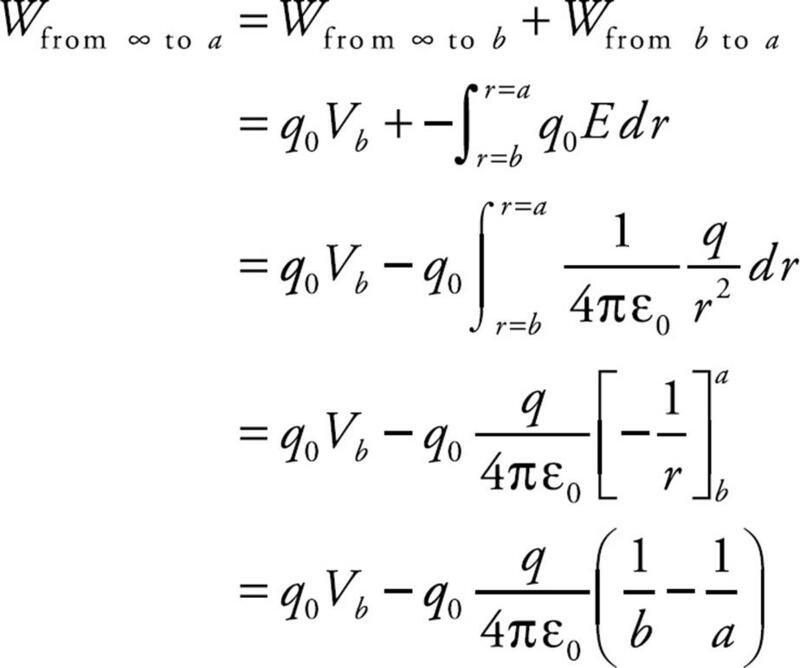 Thus, the work done by the electric field as q moves from A to B is simply equal to the work it does along r2. 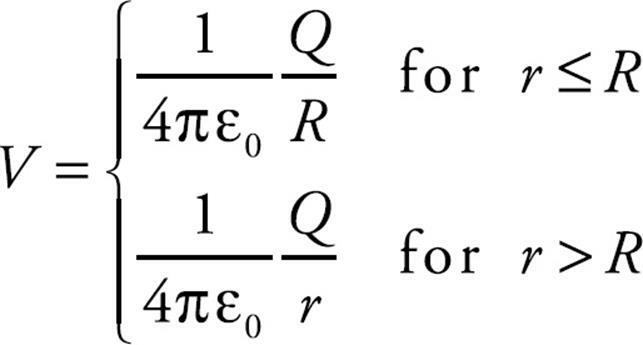 And since the length of r2 is d = r cos θ, we have WE = FEd = qEd, just as before. This definition says that when the charges are infinitely far apart, their potential energy is zero. Example 5 A positive charge q1 = +2 × 10–6 C is held stationary, while a negative charge, q2 = –1 × 10–8 C, is released from rest at a distance of 10 cm from q1. Find the kinetic energy of charge q2 when it’s 1 cm from q1. So the gain in kinetic energy is +0.016 J. 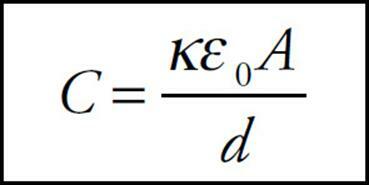 Since q2 started from rest (with no kinetic energy), this is the kinetic energy of q2 when it’s 1 cm from q1. Example 6 Two positive charges, q1 and q2, are held in the positions shown below. 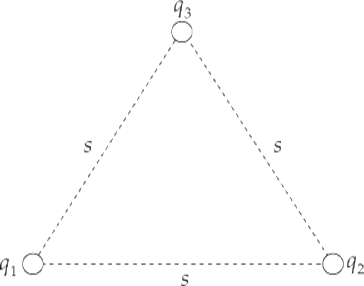 How much work would be required to bring (from infinity) a third positive charge, q3, and place it so that the three charges form the corners of an equilateral triangle of side length s? Electric potential is electrical potential energy per unit charge; the units of electric potential are joules per coulomb. One joule per coulomb is called one volt (abbreviated V); so 1 J/C = 1 V.
Note that the potential depends on the source charge making the field and the distance from it. Example 7 Let Q = 2 × 10–9 C. What is the potential at a Point P that is 2 cm from Q? This means that the work done by the electric field on a charge of q coulombs brought from infinity to a point 2 cm from Q would be –900q joules. Note that, like potential energy, potential is a scalar. In the preceding example, we didn’t have to specify the direction of the vector from the position of Q to the Point P, because it didn’t matter. At any point on a sphere that’s 2 cm from Q, the potential will be 900 V. These spheres around Q are called equipotential surfaces, and they’re surfaces of constant potential. Their cross sections in any plane are circles and are (therefore) perpendicular to the electric field lines. The equipotentials are always perpendicular to the electric field lines. Example 8 How much work is done by the electric field as a charge moves along an equipotential surface? Solution. 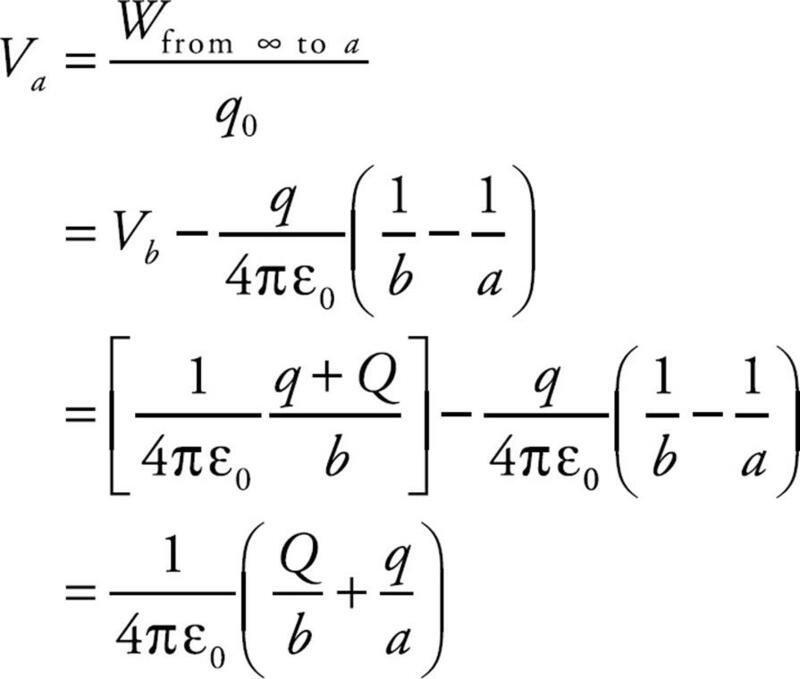 If the charge always remains on a single equipotential, then, by definition, the potential, V, never changes. Therefore, ΔV = 0, so ΔUE = 0. 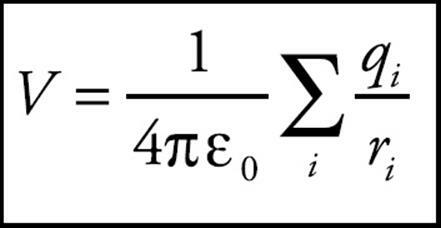 Since WE = – ΔUE, the work done by the electric field is zero. Solution. Potentials add like ordinary numbers. Therefore, the potential at A is just the sum of the potentials at A due to q1 and q2. 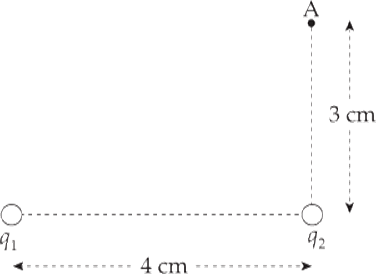 Note that the distance from q1 to A is 5 cm. Example 10 How much work would it take to move a charge q = +1 × 10–2 C from Point A to Point B (the point midway between q1 and q2)? 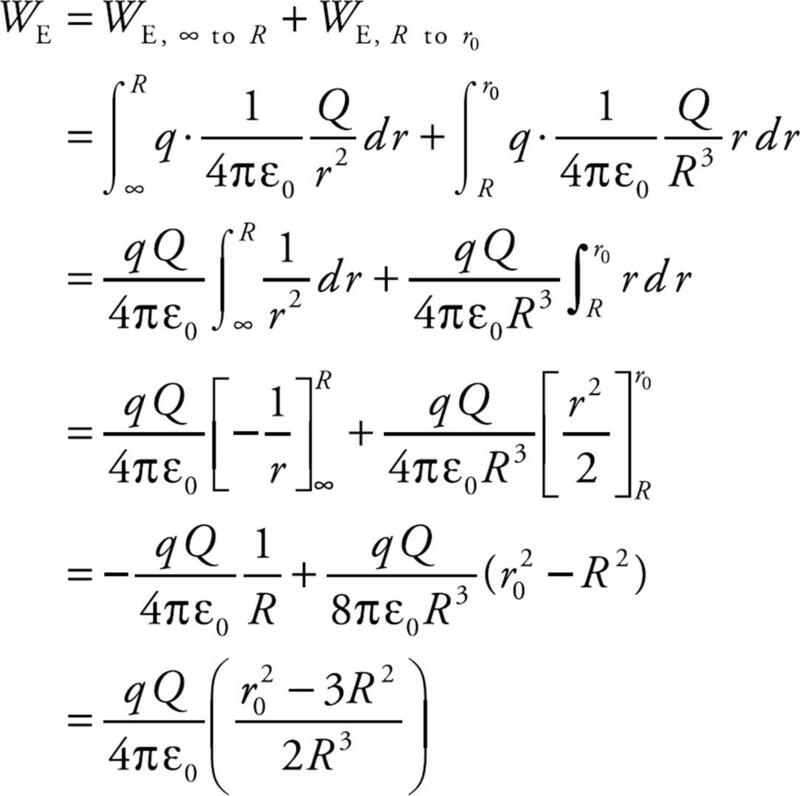 This is the work required by an external agent to move q from A to B. What is the potential at a point which is a distance d from the sheet, relative to the potential of the sheet itself? This says that for a positive s, the potential decreases linearly as we move away from the plate. Example 12 Two large flat plates—one carrying a charge of +Q, the other –Q—are separated by a distance d. The electric field between the plates, E, is uniform. Determine the potential difference between the plates. Therefore, if the potential difference and the distance between the plates are known, then the magnitude of the electric field can be determined quickly. The same is also true for a solid conducting sphere of charge Q. 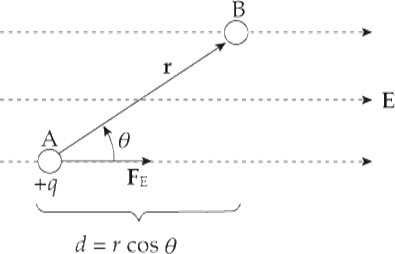 Example 13 The figure below shows two concentric, conducting, thin spherical shells. The inner shell has a radius of a and carries a charge of q. The outer shell has a radius of b and carries a charge of Q. The inner shell is supported on an insulating stand. (a) What would the potential of the inner shell be if the outer shell were absent? (b) What is the potential of the inner shell with the outer shell present? (c) Show that the potential difference between the inner shell and the outer shell, Va – Vb, does not depend on the charge on the outer shell. 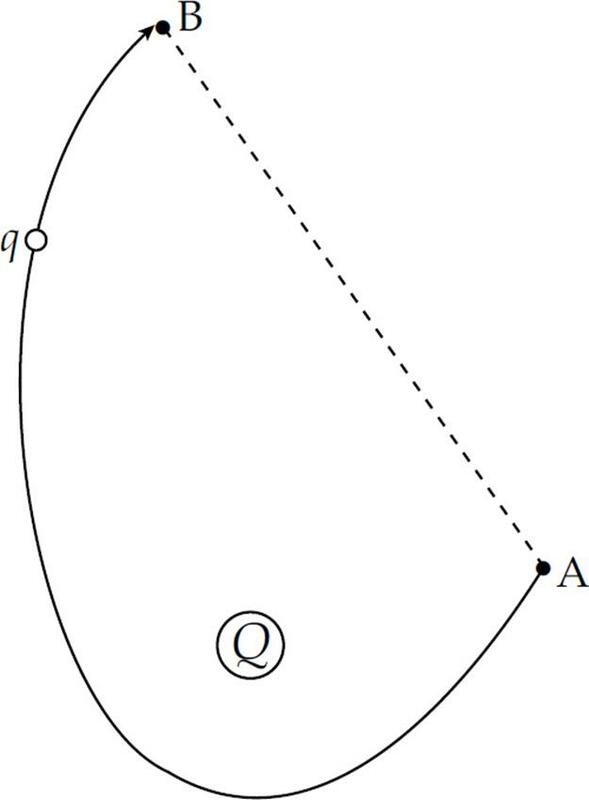 (a) The potential on (and within) a sphere of radius a containing a charge q is given by the equation Va = (1/4πε0)(q/a). (b) The potential inside the outer sphere (if the inner sphere were absent) is equal to (1/4πε0)(Q/b). The potential of the inner sphere if the outer sphere were absent is (1/4πε0)(q/a). 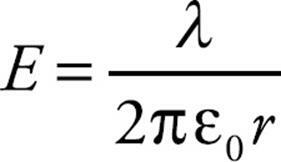 So the potential of the inner sphere with the outer sphere present is the sum: (1/4πε0)(Q/b) + (1/4πε0)(q/a). This expression does not depend on Q, which is what we were asked to show. What is the potential inside the sphere? That is, what is the potential at a distance r from the sphere’s center? Note how this result differs from the potential of a conducting sphere. In that case, the potential was constant throughout the interior of the sphere (and was equal to the value of the potential on the surface). In this case the potential is not constant; it depends on r.
Determine a formula for the potential at a point outside the cylinder, relative to the potential on the cylinder. 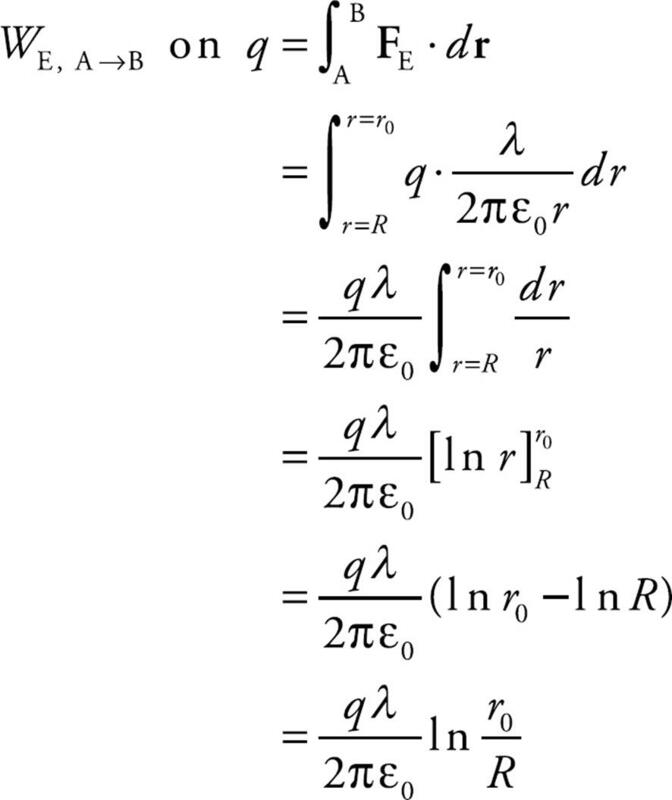 So, if we know how the potential varies as a function of r, we can determine the electric field variation with r.
Example 16 If the potential at a distance r from a source point charge Q is given by the equation V(r) = (1/4πε0)(Q/r), determine a formula for the electric field. a result we know well. 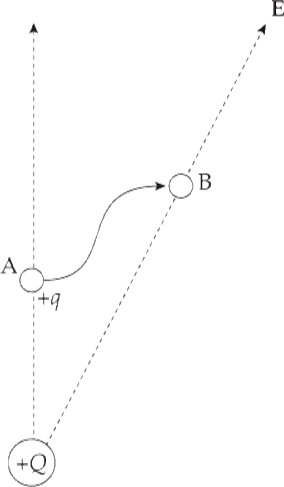 Consider two conductors, separated by some distance, that carry equal but opposite charges, +Q and –Q. Such a pair of conductors comprise a system called a capacitor. Work must be done to create this separation of charge, and, as a result, potential energy is stored. Capacitors are basically storage devices for electrical potential energy. The conductors may have any shape, but the most common conductors are parallel metal plates or sheets. These types of capacitors are called parallel-plate capacitors. We’ll assume that the distance d between the plates is small compared to the dimensions of the plates since, in this case, the electric field between the plates is uniform. 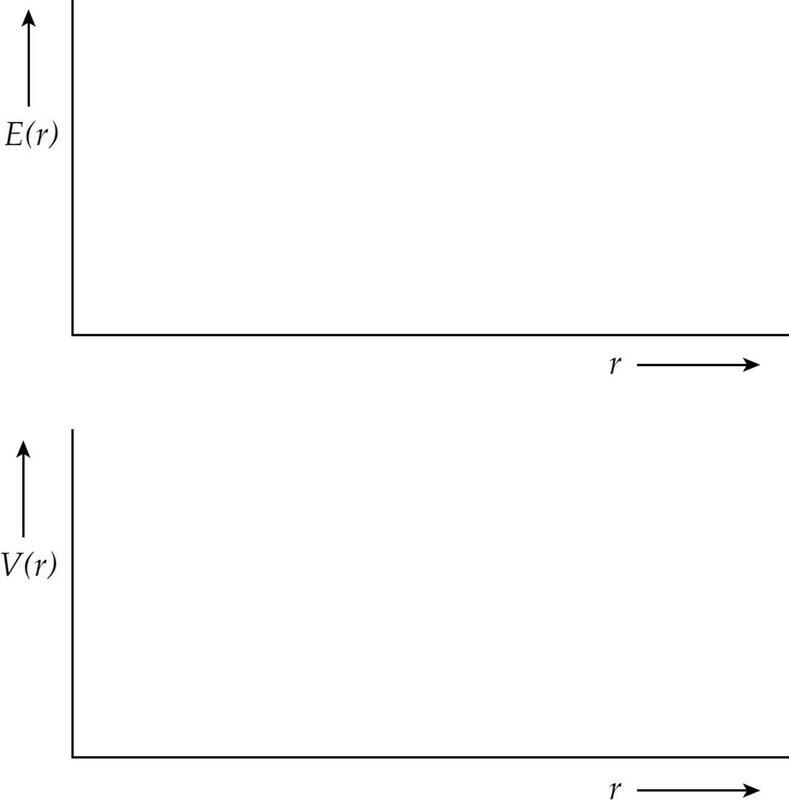 The electric field due to one such plate, if its surface charge density is σ = Q/A, is given by the equation E = σ/(2ε0), with E pointing away from the sheet if σ is positive and toward the plate if σ is negative. The capacitance measures the capacity for holding charge. 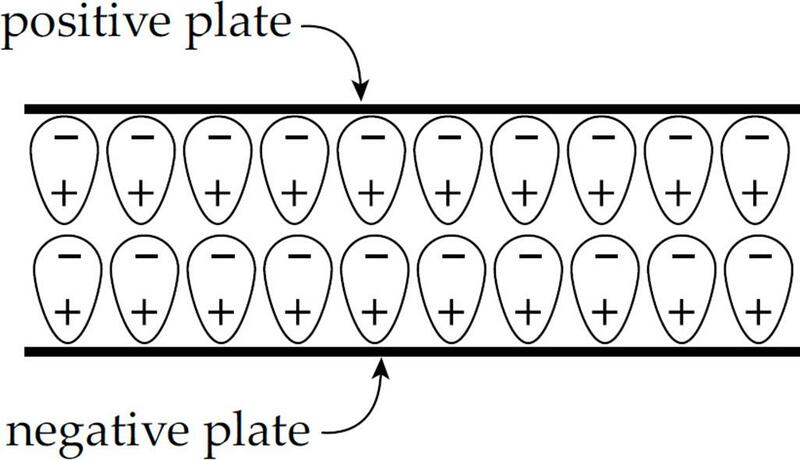 The greater the capacitance, the more charge can be stored on the plates at a given potential difference. The capacitance of any capacitor depends only on the size, shape, and separation of the conductors. From the definition, C =Q/ΔV, the units of C are coulombs per volt. One coulomb per volt is renamed one farad (abbreviated F): 1 C/V = 1 F.
Example 17 A 10-nanofarad parallel-plate capacitor holds a charge of magnitude 50 µC on each plate. (a) What is the potential difference between the plates? 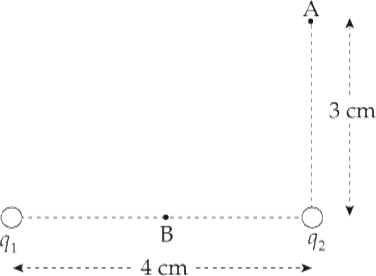 (b) If the plates are separated by a distance of 0.2 mm, what is the area of each plate? Example 18 A long cable consists of a solid conducting cylinder of radius a, which carries a linear charge density of +λ, concentric with an outer cylindrical shell of radius b, which carries a linear charge density of –λ. This is a coaxial cable. Determine the capacitance of the cable. Example 19 A spherical conducting shell of radius a, which carries a charge of +Q, is concentric with an outer spherical shell of radius b, which carries a charge of –Q. What is the capacitance of this spherical capacitor? Capacitors are often arranged in combination in electric circuits. Here we’ll look at two types of arrangements, the parallel combination and the series combination. 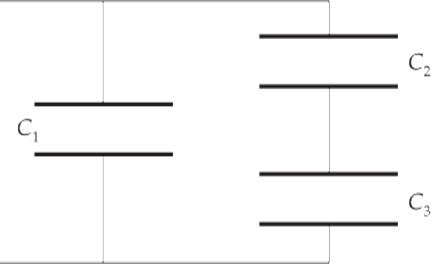 The top plates are connected by a wire and form a single equipotential; the same is true for the bottom plates. Therefore, the potential difference across one capacitor is the same as the potential difference across the other capacitor. So the equivalent capacitance of a collection of capacitors in parallel is found by adding the individual capacitances. In words, the reciprocal of the capacitance of a collection of capacitors in series is found by adding the reciprocals of the individual capacitances. One method of keeping the plates of a capacitor apart, which is necessary to maintain charge separation and store potential energy, is to insert an insulator (called a dielectric) between the plates. A dielectric always increases the capacitance of a capacitor. Let’s see why this happens. Imagine charging a capacitor to a potential difference of V with charge +Q on one plate and –Q on the other. Now disconnect the capacitor from the charging source and insert a dielectric. What happens? 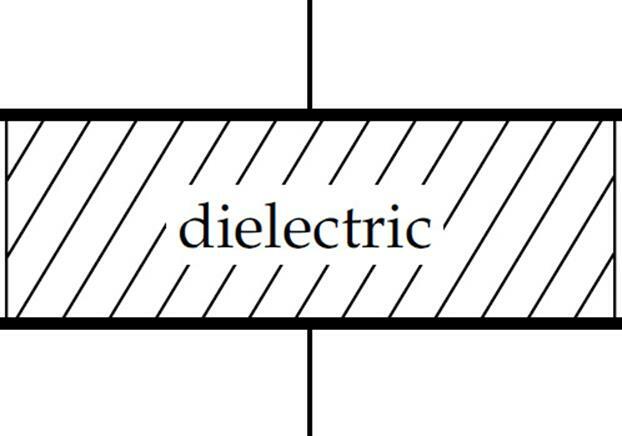 Although the dielectric is not a conductor, the electric field that existed between the plates causes the molecules within the dielectric material to polarize; there is more electron density on the side of the molecule near the positive plate. The value of κ, called the dielectric constant, varies from material to material, but it’s always greater than 1. Although the description for why the capacitance increases with the insertion of a dielectric assumed that the source that charged the capacitor was disconnected (so that Q remains constant), the same result holds if the source of potential remains connected to the capacitor. 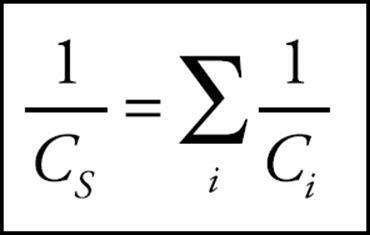 The capacitance still increases, but because ΔV must now remain constant, the equation Q = CΔV tells us that more charge will appear on the plates (because C increases). The presence of a dielectric also limits the potential difference that can be applied across the plates. If ΔV gets too high, then E = ΔV/d gets so strong that electrons in the dielectric material can be ripped right out of their atoms and propelled toward the positive plate. This discharges the capacitor (and typically burns a hole through the dielectric). This event is called dielectric breakdown. 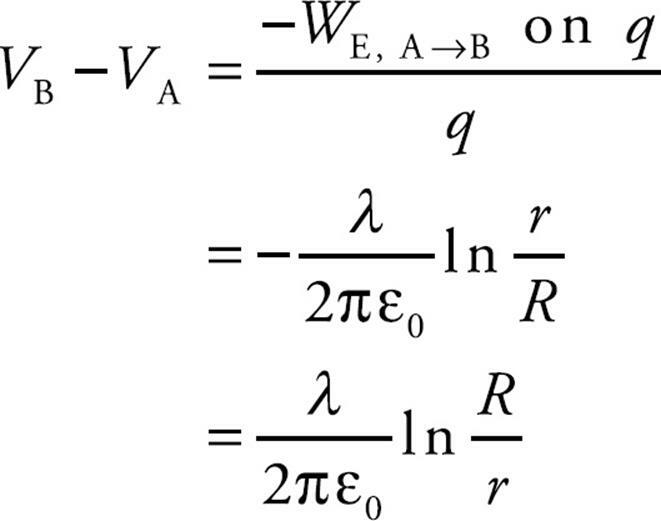 The capacitance formulas derived in this chapter have assumed that no dielectric was present; the permittivity constant that appears in the formulas is ε0, the permittivity of free space (vacuum). If a dielectric is present, then the permittivity increases to ε = κε0, so the occurrence of ε0 in each formula is simply replaced by ε = κε0. Example 21 Find the charge stored and the voltage across each capacitor in the following circuit, given that ε = 180 V, C1 = 30 µF, C2 = 60 µF, and C3 = 90 µF. 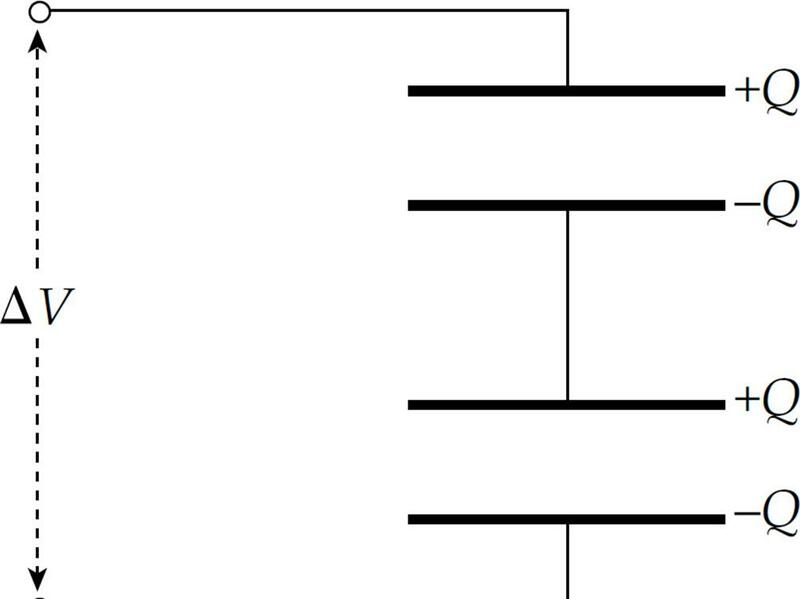 Example 22 In the diagram below, C1 = 2 mF and C2 = 4 mF. When Switch S is open, a battery (which is not shown) is connected between points a and b and charges capacitor C1 so that Vab = 12 V. The battery is then disconnected. After the switch is closed, what will be the common voltage across each of the parallel capacitors (once electrostatic conditions are reestablished)? (b) the maximum amount of charge that can be placed on the plates, given that polystyrene suffers dielectric breakdown if the electric field exceeds 20 million volts per meter. Notice the units for ε0; in calculations that involve capacitance, it is usually easier to write F/m rather than C2/N·m2. 1. Which of the following statements is/are true? I. If the electric field at a certain point is zero, then the electric potential at the same point is also zero. II. If the electric potential at a certain point is zero, then the electric field at the same point is also zero. III. 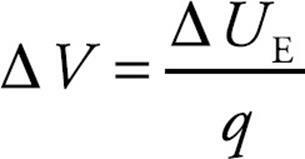 The electric potential is inversely proportional to the strength of the electric field. 3. Three 6 µF capacitors are connected in parallel to a 9 V battery as shown above. Determine the energy stored in each capacitor. 6. Which points in this uniform electric field (between the plates of the capacitor) shown above lie on the same equipotential? 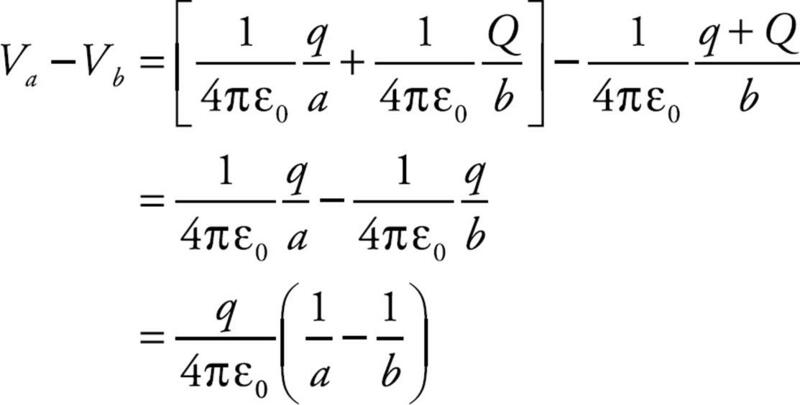 (E) 1, 2, 3, and 4 all lie on the same equipotential since the electric field is uniform. 7. Two isolated and widely separated conducting spheres each carry a charge of –Q. Sphere 1 has a radius of a and Sphere 2 has a radius of 4a. If the spheres are now connected by a conducting wire, what will be the final charge on each sphere? 8. A parallel-plate capacitor is charged to a potential difference of ΔV; this results in a charge of +Q on one plate and a charge of –Q on the other. The capacitor is disconnected from the charging source, and a dielectric is then inserted. What happens to the potential difference and the stored electrical potential energy? (A) The potential difference decreases, and the stored electrical potential energy decreases. (B) The potential difference decreases, and the stored electrical potential energy increases. (C) The potential difference increases, and the stored electrical potential energy decreases. (D) The potential difference increases, and the stored electrical potential energy increases. (E) The potential difference decreases, and the stored electrical potential energy remains unchanged. 9. 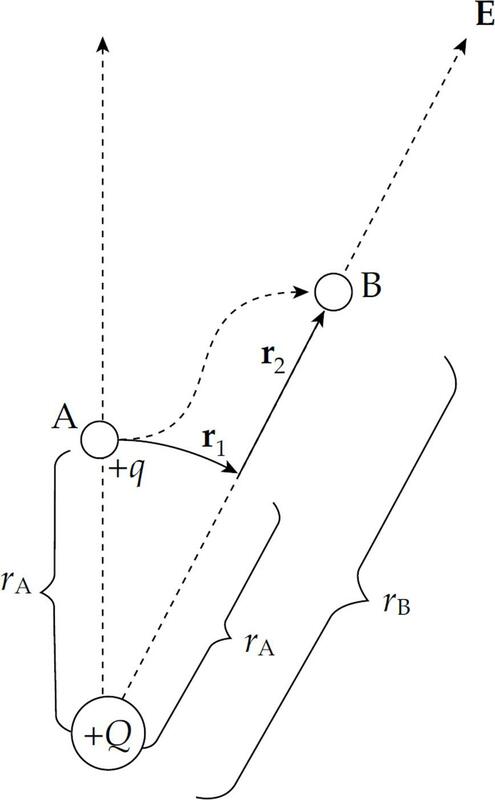 How much work would the electric field (created by the stationary charge Q) perform as a charge q is moved from Point A to B along the curved path shown? VA = 200 V, VB = 100 V, q = –0.05 C, length of line segment AB = 10 cm, length of curved path = 20 cm. 10. If each of the capacitors in the array shown above is C, what is the capacitance of the entire combination? 11. The diagram above shows equipotential lines produced by a charge distribution. A, B, C, D, and E are points in the plane. An electron begins at point A. The electron is then moved to point E and then from point E to point C. Which of the following correctly describes the work done by the field for each part of the movement? 1. 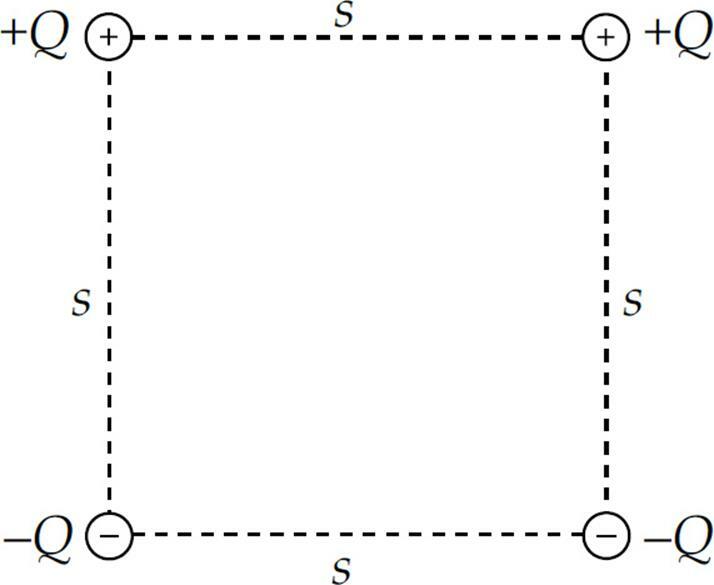 In the figure shown, all four charges are situated at the corners of a square with sides s.
(a) What is the total electrical potential energy of this array of fixed charges? (b) What is the electric field at the center of the square? 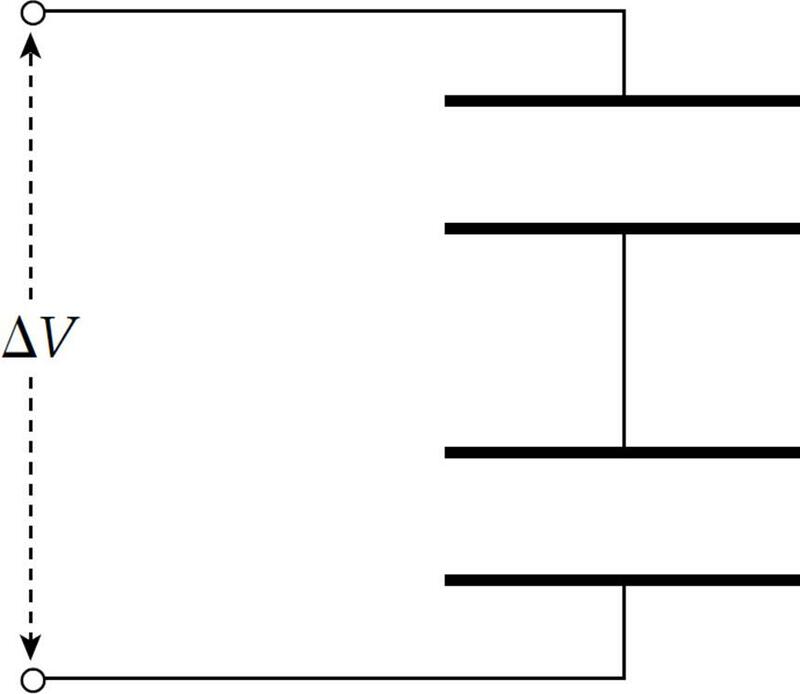 (c) What is the electric potential at the center of the square? (d) Sketch (on the diagram) the portion of the equipotential surface that lies in the plane of the figure and passes through the center of the square. (e) How much work would the electric field perform on a charge q as it moved from the midpoint of the right side of the square to the midpoint of the top of the square? 2. 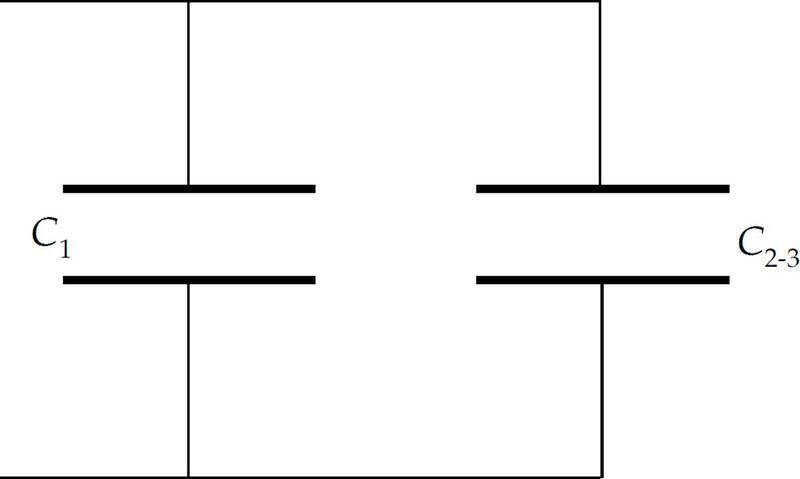 The figure below shows a parallel-plate capacitor. Each rectangular plate has length L and width w, and the plates are separated by a distance d.
(b) In the diagram, sketch the electric field vector at the position of the electron when it has traveled a horizontal distance of L/2. (c) In the diagram, sketch the electric force vector on the electron at the same position as in part (b). (d) Determine the strength of the electric field between the plates. Write your answer in terms of L, d, m, e, and v0. 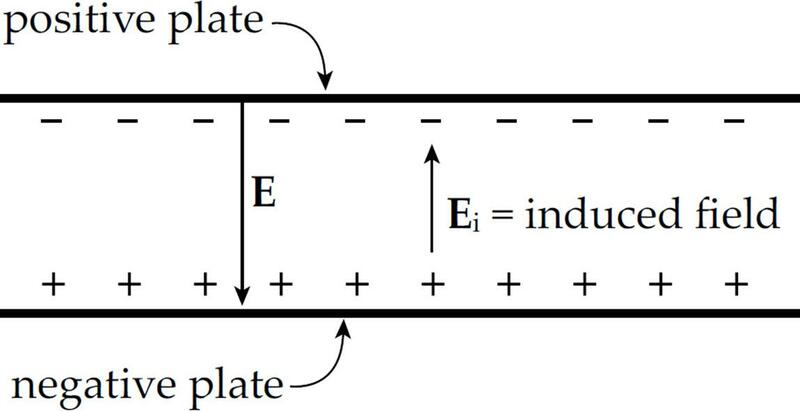 (e) Determine the charge on the top plate. (f) How much potential energy is stored in the capacitor? 3. 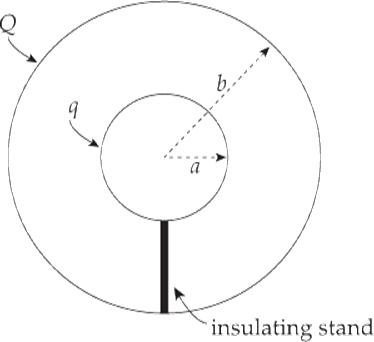 A solid conducting sphere of radius a carries an excess charge f Q. (a) Determine the electric field magnitude, E(r), as a function of r, the distance from the sphere’s center. (b) Determine the potential, V(r), as a function of r. Take the zero of potential at r = ∞. 4. A solid, nonconducting sphere of radius a has a volume charge density given by the equation ρ(r) = ρ0(r/a)3, where r is the distance from the sphere’s center. (a) Determine the electric field magnitude, E(r), as a function of r.
(c) On the diagrams below, sketch E(r) and V(r). Be sure to indicate on the vertical axis in each plot the value at r = a. When a positive test charge q0 moves through an electric field, its electric potential energy changes. The change in electric potential energy is: . Note that this is a dot product between the electric field and the path, ds. When the electric field is uniform then ΔU = –q0Ed, where d is the distance along the electric field that the charge moved. The electric potential is the electric potential energy divided by the test charge. Therefore . This can also be rearranged as . 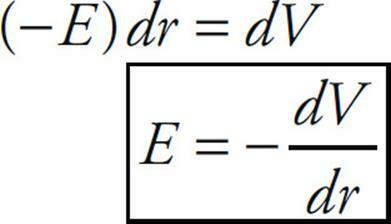 Either one of these equations can be used to relate the electric potential to the electric field strength. The units of electric potential are volts (V), and it is often called voltage. 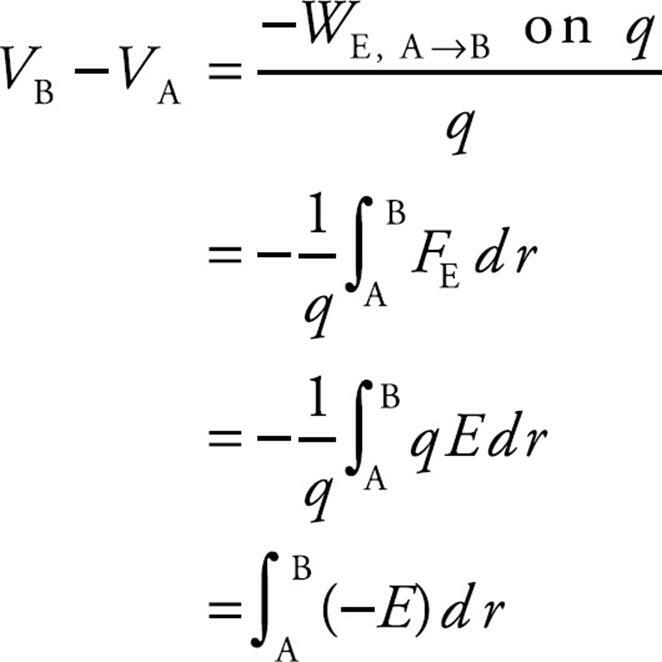 The electric potential due to a point charge, Q, is . Capacitors store electric potential energy by separating opposite charges. Capacitance is measured by the ratio of the charge stored to the potential difference across the capacitor: . The units are farads (F). Dielectrics are used in capacitors to induce an opposing electric field that decreases the total electric field between the plates. This decreases the electric potential and therefore increases the capacitance.